Sen. Chuck Schumer, D-N.Y., and Rep. Nancy Pelosi, D-Calif.
President Trump on Thursday ordered the postponement of House Speaker Nancy Pelosi’s congressional junket to Brussels, Egypt and Afghanistan only an hour before its departure was scheduled. The president argued it would be better for her to be in Washington so she could negotiate an end to the government shutdown. “Due to the Shutdown, I am sorry to inform you that your trip to Brussels, Egypt, and Afghanistan has been postponed,” the president wrote in a letter to Pelosi. “We will reschedule this seven-day excursion when the Shutdown is over. He said that if she chose, she still could fly commercial. The decision followed by just a day Pelosi’s letter to Trump urging him to delay his Jan. 29 State of the Union address until the shutdown is over. Trump did not respond. 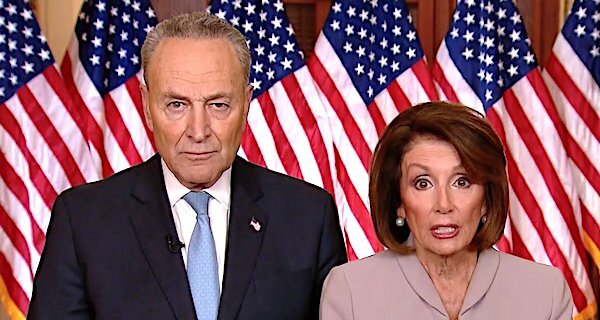 The shutdown is over Democrats’ opposition to Trump’s insistence on some $5.7 billion for border security, including a border barrier. Fox News sources said the announcement from the White House, which controls the military jets that Pelosi was intending to use, came as members of the speaker’s team were preparing to leave. Some already were on an Air Force bus in Washington awaiting their ride to the jet. Fox News said a source said the White House reasoned that the trip would keep Pelosi out of the country beyond next Tuesday nigh, when the next government pay period would occur. The report claimed the White House was “completely caught off guard” by Pelosi’s State of the Union demands.